Guests wishing to leave The Diamond but planning to return during the same game must have their ticket and hand stamped at the gate prior to exiting. No alcohol is permitted upon exiting. No outside food or beverage may be brought into The Diamond. Exceptions include: One 20oz bottle of water per person, baby formula or liquids that are required for medical reasons. Please alert the security staff of any liquids into the stadium upon arrival. Promotional items are distributed to guests who meet specific promotions requirements such as age limit or for the first pre-determined number of fans through the gate. Promotional items are not available to pick up prior to gates opening. Promotional items are given on a per-person, not per-ticket, basis. For a complete list of promotional items call the Storm front office at 951-245-4487 or look on the promotional schedule online here. If legal game is not played, this rain check may be exchanged, subject to availability, for a ticket of equal or lesser value, good at any Lake Elsinore Storm regular season home game excluding exhibition games or Independence Day celebrations. 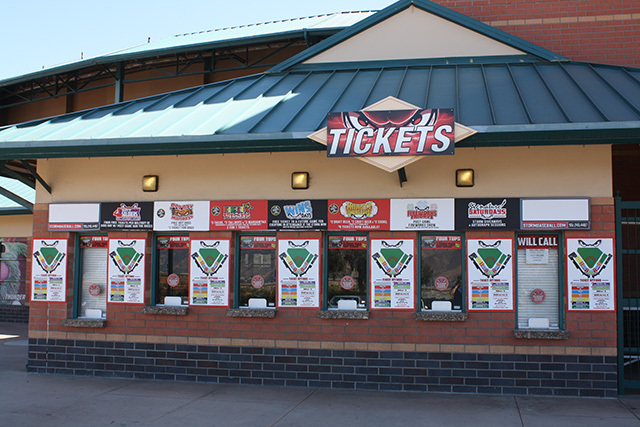 The Lake Elsinore Storm does not offer any refund or exchanges once a ticket has been purchased. 1) Print at Home Guests receive a separate e-mail containing their print at home tickets. However, if their system has a spam blocker enabled, the attachment may be blocked. Guests must have Adobe Acrobat software (free online) to use this option. 2) Will Call Tickets may be picked up at any open ticket window during normal business hours. Guests should bring a photo ID when picking up tickets at will call. 3) Mail Tickets ordered over the phone at least two weeks prior to the game will be mailed first class.